In Cigars of the Pharaoh (1934), Tintin finds himself entangled in a drug trafficking ring that will take him all the way to India. In the meantime, he meets Thomson and Thompson, two clumsy policemen whose role will progressively become more important throughout the series. Tintin, fighting against the drug traffickers of Egypt and India, meets with a few characters he will encounter again soon, Villains such as Allan Thomson or the mysterious Rastapopoulos as well as some of his future companions like Seor Oliveira. The first cover for Cigars of the Pharaoh was made up of a small picture stuck onto white boards. The black and white edition was eventually published with three variations of this cover. In 1942, Hergé created a cover which broke away from the 'small picture' format and marked the beginning of a bold new style. The first colour version was published in 1955, with a new cover. The Blue Lotus marks the beginning of a working relationship that carried on far beyond the end of the adventure itself. In 1934, Louis Casterman proposed that Hergé receive royalties of 3 francs per book sold (15% of the 20-franc retail price) for the first 10,000 copies, and two francs per sale thereafter. The story marked a turning point in the young illustrator's career, after which Tintin's adventures became suffused with fantasy, mystery and suspense. Hergé toyed with readers in new ways, introducing dream sequences and hallucinations. The author opened up an eerie and scary dimension to the narrative as he mummified his characters. Hergé read novels and adventure stories, and as an author he was inspired by certain ideas that he discovered through reading. 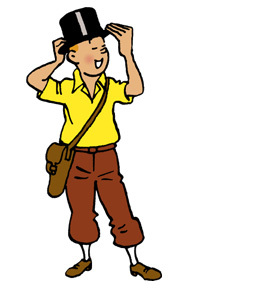 While conducting his research Hergé was inspired by the work of Jean-Francois-Désiré Capart, an Egyptologist (born in Brussels on 21 February 1877) who 'became' Professor Tarragon in The Seven Crystal Balls). The dialogue of frame A3 on page 19, 'If you've given me away, just remember this. My boat is mined, and I'll blow her sky high before I'll surrender!' is directly inspired by a passage in the autobiography of Henry de Monfreid, Secrets of the Red Sea, 1931. Henry de Monfreid was an infamous real-life character at the time Cigars of the Pharaoh was being written. Drug smuggler, arms dealer and pearl diver, de Monfreid was by all accounts an undesirable rogue, although he never acquired a reputation for being unpleasant or cruel. Setting sail for Djibouti in 1911, de Monfreid restlessly crisscrossed the seas for over twenty years. He quickly became aware of the profitability of gun running in the region, which was ravaged by tribal warfare. In this way he sadly contributed to the general instability in the Middle East. Real people often inspired Hergé as he created his paper characters. In the 1934 black and white version, police officers X33 and X33a tirelessly and mercilessly pursue a hapless Tintin. Renamed Thomson and Thompson in the reformatted 1955 colour version, Cigars of the Pharaoh is the adventure in which the bowler-hatted detectives make their first appearance. Hergé may have been inspired by a photograph on the cover of the 2 March 1919 issue of Paris newspaper Miroir. He certainly based key features of the Thom(p)sons on his father and uncle, who were identical twins. But how can you tell Thomson from Thompson? The ends of Thomson's moustache flare out a bit! - Roberto Rastapopoulos, perhaps the baddest of the baddies in Tintin, plays his first major role, although he does appear in a single frame at the end of Tintin in America, at the banquet being thrown in Tintin's honour. - Oliveira da Figueira is a Portuguese salesman, who reappears in several other adventures to help Tintin get out of a tight spot. This character has the gift of the gab, which he puts to good use in his profession. - Allan Thompson, the dangerous criminal accomplice of Rastapopoulos, appears in the 1955 colour version. It is a mark of Hergé's genius that he advertised his books within his books! This was an original idea at the time. In the first black and white version, Sheik Patrash Pasha proudly shows off his copy of Tintin in America, which had just been republished in 1934! We can see the amazement on Tintin's face in the colour version (1955), when the Sheik whips out a copy of Destination Moon, an adventure that was written much later than Cigars of the Pharaoh! The author and publisher decided that a little anachronism was allowed for the sake of artistic licence and marketing. The symbol of Pharaoh Kih-Oskh is the motif which links the different places - Egypt, the Middle East and India - that Tintin visits. Hergé was inspired by the symbol of the yin yang as he came up with the design of this memorable sign. In the black and white edition, the actor whose entrance is spoiled by Tintin's well-intentioned intervention, is clearly inspired by real-life Hollywood star Rudolph Valentino, who played a lead role in The Sheik (1921). In the colour version, the actor's physique corresponds with the ideals of masculinity prevalent in the 1940s and 1950s; the character is reminiscent of American actor Gary Cooper. All of a sudden the scenery changes as Tintin crash-lands his aeroplane in India, while trying to shake of a fighter plane that is hot on his tail. He finds himself in the middle of the Indian jungle. The little reporter is surrounded by lush vegetation in territory populated by elephants and the odd tiger. At the time India was under the control of Great Britain, during a period that was called the British Raj. This adventure and its sequel The Blue Lotus features references to the Ku Klux Klan and depicts opium dens. But somehow certain stereotypes about unscrupulous financiers from New York are sooner censored. Classic.... timeless... makes excellent reading any day!!! I love Tintin stuff right from 1976! Glad to now own the digital editions! After I downloaded the book in English I lost the French version. How can I swap back? Brilliant book, a classic. Faster download and working great with iOS 9. Looking forward to more!